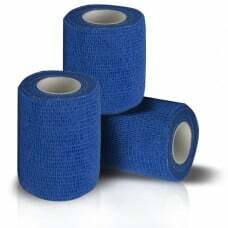 Blue detectable cohesive bandage. Designed specifically for anyone that deals in food products. Cohesive or self-adhering bandage does not stick to the skin BUT it does stick to itself. It can be removed and reused several times. Cohesive Bandages are constructed from a blend of non-woven fibres and methacrylate adhesive. Blue colour allows easy detection as required within food or veterinary industries.